Lock in a great price for Bungalows Manuka – rated 8.5 by recent guests! This is more like an airbnb than a hotel or motel. The kitchen is pretty well equipped for cooking except there isn’t a coffee maker but we made do using paper towels for filters. The driver stopped at a nearby market so we could load up on provisions before checking into the bungalow - which was a great help. They arranged a tour to go snorkeling for us but it was canceled due to weather - we were here in the rainy season The bungalow itself is really comfortable and has a/c. The sandy beach is right across the road. We went swimming in between rainy periods. This was way less expensive than the resorts. Walk across to beautiful beach and near restaurants. Conceirge was great, booked last minute tour for us and was always available for questions. Bungalow was Clean! The location was a 5 minute walk to a good dive shop. You could snorkel at the nearby beach, and see some colorful fish. It is possible to walk to a grocery store and restaurants for lunch. The host Jeremy was nice, and gave us a ride to the village to see the Heiva dance/song performance, which was worth it to see. The unit has a good kitchen, an ac, good wifi (for an island), and was spacious. If we needed anything, Jeremey was nearby to ask. It was a comfortable stay. They also have french TV you can watch. For diving, it was very convenient place to stay. The bungalow was generally very comfortable and had most of what we needed. The amazing beach and lagoon was only a few steps away and the free kayaks were great. Sitting on the deck in the evening was very relaxing, privacy was good and nearby to supermarket and some eateries. A fantastic stay. Excellent Service, very efficient people! Very helpful on everything... and the bungalow is nice with everything you need even free Kayak to go on the lagoon...5 secondes walk to the beach! Nice bungalow just a few steps away from the Matira beach. The bungalow offers all the comfort you need with some good restaurants just a few minutes away. The patio offers one long chair and a small table. Bungalows Manuka This rating is a reflection of how the property compares to the industry standard when it comes to price, facilities and services available. It's based on a self-evaluation by the property. Use this rating to help choose your stay! 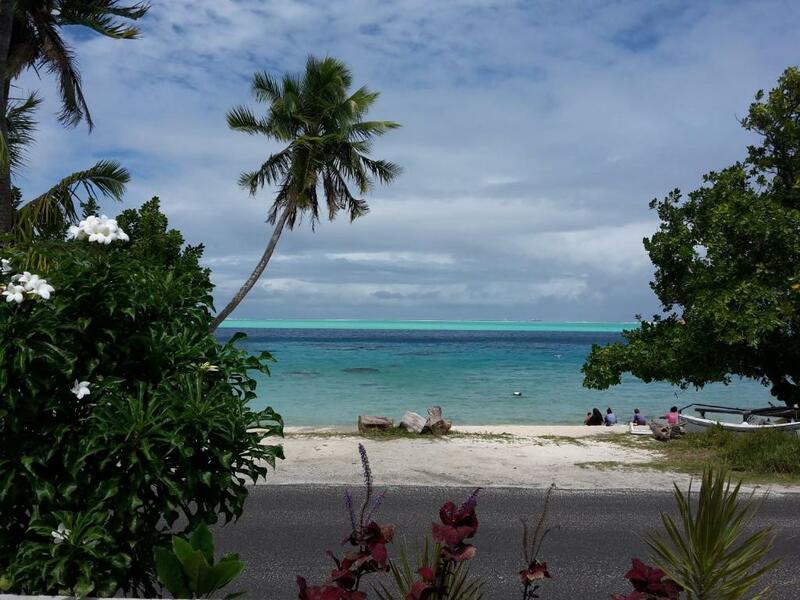 Bungalows Manuka offers accommodations in Bora Bora, 2 minutes' walk from Matira Beach. Each bungalow is fitted with a flat-screen TV. The rooms are fitted with a private bathroom with a bathtub and shower. You can engage in various activities, such as snorkeling and canoeing. Vaitape is 1.4 mi from Bungalows Manuka, while Tahaa is 17 mi away. The nearest airport is Motu-Mute Airport, 5 mi from Bungalows Manuka. When would you like to stay at Bungalows Manuka? This bungalow has a oven and sofa. House Rules Bungalows Manuka takes special requests – add in the next step! A XPF21000 damage deposit is required 14 days before arrival (about USD197.86). This deposit will be fully refunded 14 days after check-out, as long as there isn't any damage to the property. All children under 16 years are charged XPF 1000 per night for extra beds. Any additional older children or adults are charged XPF 2000 per night for extra beds. Bungalows Manuka accepts these cards and reserves the right to temporarily hold an amount prior to arrival. Please note that the price is based on 2 guests using the king size bed. There is an additional XPF1800 charge per night for the 3rd guest using a mattress on the floor or a sofa. Please note that check in and check out times can be flexible. For further information please contact the property in advance, using the contact details found on the booking confirmation. Please inform Bungalows Manuka of your expected arrival time in advance. You can use the Special Requests box when booking, or contact the property directly using the contact details in your confirmation. A damage deposit of XPF 21000 is required. The host charges this 14 days before arrival. That's about 197.86USD. You should be reimbursed within 14 days of check-out. Your deposit will be refunded in full by bank transfer, subject to an inspection of the property. The air-conditioning was totally inadequate. The unit was clearly too small for the bungalow and the ceiling fan didn't work, which would have helped a lot. During the afternoon the heat inside was almost unbearable on some days. Some people would really struggle in the heat. There was also supposed to be a bath but it was covered over with the washing machine on top. The shower drained very slowly because the drain was blocked and there were no hand towels and very little toilet paper. These small things take the shine off what should have otherwise been a great bungalow - but the air-conditioning was by far the biggest issue. The road between you and the beach is moderately busy. But we don't really care. A sun protection outside for the table is missing. It was too hot with the direct sun to eat outside. The only downside are the chickens that wake you up at 5am, but then you go out and see the amazing day outside and must agree that the chickens were right and was time to wake up! This was the best stay of our trip, great service and accommodation! The bungalow is 4 steps from Matira Beach, has 2 kayaks available and a great deck to have breakfast in the garden or chill after the beach. Manihi took great care of us, she is amazing! Great location, best snorkeling on the Matira Beach is just across the road from property. People managing the property are very helpful, and Mani who worked with us did everything to make our stay even better than we expected. We will for sure choose this property for our next stay. The fact it was located just next to the road. Great location 10m from the beach (just across the road). Apartment is well equipped with a little kitchen. Host Mihu is very friendly and offered ttansport from vaitape. Will recommend. A little basic in kitchen ware but we managed fine. The bungalow is spacious and comfortable. It is located right across from the beach and easy walking distance to restaurants and other facilities (car and bike hire). Snorkeling off the beach is good and you can use the free kayak to paddle to the "aquarium" which is great for tropical fish. Maru is very helpful and I recommend booking any excursions through him as he gets a very good rate. Literally across the road from one of the best beaches in the world. The property was clean and had all necessities. The use of the kayak was free of charge.